Now that it’s fall, lots of squash is popping up in our farmers’ market. We picked up two Kabocha squash, which are actually available year round. Kabocha is a Japanese variety of winter squash, but it has become to mean any squash in the buttercup family. 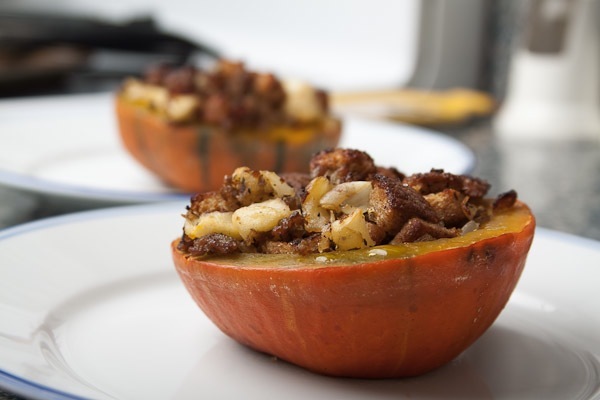 You can use Kabocha squash in any recipe that calls for buttercup squash. It has a great strong, sweet and nutty flavor and is intensely orange. The Kabocha squash are “personal” sized – so get one squash per person. With the hearty sausage and apple filling, it definitely is a main dish. You may be full after eating one half, but it is so tasty, you’ll want the second half! Plus, I think it would definitely taste best eaten straight from the oven, rather than reheated later. This recipe was adapted from several that we found on the internet. Cut the squash in half, and scoop out the seeds. Trim the top and bottom of the squash so that the halves sit level. 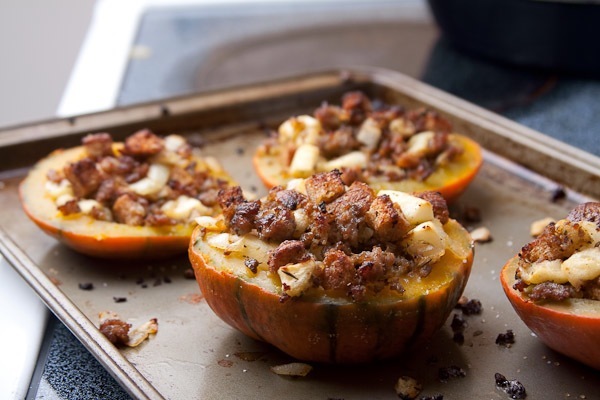 Place the squash in a high rimmed baking dish and pour in about an inch of water. Bake the squash for 45 minutes or until the squash is tender. 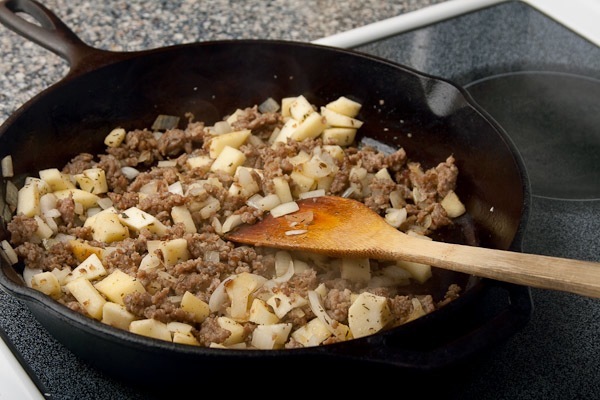 While the squash is baking, cook the sausage over medium heat until it begins to brown and brakes into small pieces, and then add the onions, apples and thyme. Add a pinch or two of salt. Cook until the onions are tender. When the squash is done, remove it from the oven and drain the water from the pan. With the squash back in the pan, stuff the squash halves with the sausage mixture. Place the oven rack 6-8″ from the broiler. Cook the squash under the broiler for 5-10 minutes or until the squash/sausage begins to brown on-top. Even though I am a vegetarian, this recipe sounds great. I can totally adapt this and make it meat free. Thanks so much for sharing!